The 90's era for those born in the late 80's growing up during this period of time, these were the years to behold, enjoy, and witness for a first time coming. Nickelodeon often shortened to just Nick, is an American basic and satellite television networking company, that was launched back in 1977, releasing a variety of programming for kids, teens, and adults alike. But during the 90's time frame where the network and it's array of programming was in its prime, one of the many television shows titled "Legends of the Hidden Temple" began airing in 1993 through 1995. Whilst this was a brief run for the show with only 3 seasons, a revival of the show would happen 23 years later, in the form of a TV movie called "Legends of the Hidden Temple". This tie in to bringing back that 90's formula including host Kirk Fogg and Dee Bradley Baker who was the announcer and voice of Olmec, would bring back so much for all of those who remembered this treasured classic. 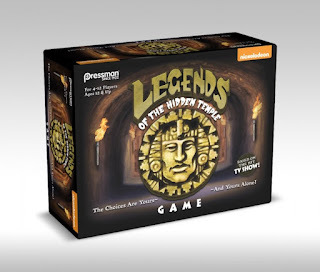 With that said, the memories of the treasured classic would not fade away in an instant, for "Legends of the Hidden Temple" would continue onward, not in a new reformed television program or film series, but in a gaming form. Not digitalized gaming but board games, that you use with your hands, mind, and wits! Indeed Pressman and Goliath gaming companies, featuring an array of titles of numerous games, both brand new, old school, or in the middle. Would take on the classic gaming show and film with a rendition of a board game, based on the TV series and film tie ins. 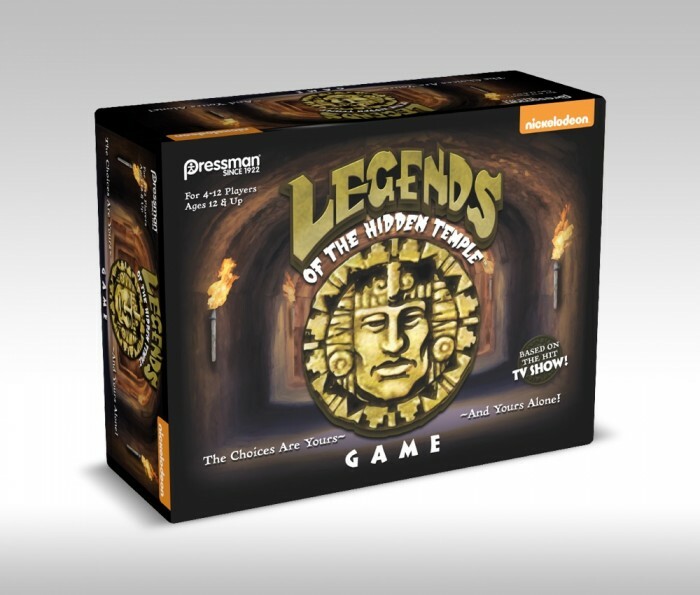 Like the TV series and film, the board game is laid out very much alike to these programs, rooms are set where they are filled with lost treasures that are being protected by the mysterious Mayan Temple Guards. Only Olmec knows the legends on these treasured items within his temple, since he is the guardian of it all. Six teams are made up, each beginning their journey but only one will get the chance to enter the temple and retrieve the lost treasures. But before any entering may occur, you must have to face tests of fortitude and intelligence, winning the pendants of life, to protect you from those temple guards who protect this place as said previously. So it is all left to you as you take on the tasks at hand and try escaping the temple just in the nick of time. These choices are yours and only yours to chose. The game itself is playable with 4-12 players believe it or not, with the age range being 12 years and older. Sorry kiddies but this is for the teens in us who can take a chance at what is to become of us within this temple of doom! How the game begins there are four rounds to face, first up is the moat, then the steps of knowledge, followed by the temple games and then the temple run! Through each round one or more teams are eliminated. The game can be played in teams, but when played with fewer people like 6 players, then the contestants can choose to complete individually or in teams as noted. Once you have your teams set into effect, the first round that is the moat takes place of course. But to make it across the moat the first, each member of said team, must roll their dice, rapidly and repeatedly, trying to get their team's logo to appear so they can move their team token across the moat. As the game continues and each contestant rolls the dice, moving across each space at a time, until reaching across then have to repeat the process, returning to the other side, then they can move onto the steps of knowledge. During the next set up of the steps of knowledge, Omlec will read a legend then the teams will get to answer the question that was just asked. After a team answers correctly then they will get a point, after the first two teams answer two questions get to move onto the next round. The next set up of round three is to enter Olmec's temple in the temple games of course. During this round a golden cup of the belshazzar is put into play, as the cup set upon the table must be flipped in a certain form, as this is the only way to earn points and gain a pendant of life. The team to do this the right way moves onto the next round and final round of the game. As the final round approaches, there are some in-between games that happen during round three, which is galileo's cannonball and the smashed printing plate of frederick douglass, how each game plays, the first one has a cannonball get launched into the air, and must land in a cup, if that happens, then the next test is to collect some cards, team who has the must cards gets a point and another pendant of life. Now that the fourth round is set into play, this final round is it, your chance at running through the temple during its temple run! You set up the boards and dice, with everything else into affect as well, the cards, tokens, etc. As it is all set, each board plays off a different room, the teams must close their eyes as they race moving their place across the board, as the other teams hide their cards, then the game continues with other setups with more cards, puzzles, and then some. It is really lots of fun, but can be confusing at times to fully understand completely. If the team that finds the lost treasure while in the temple, beating all of the puzzles and tests along the way, will win the game! When playing through the game, it was quite a challenge, to understand all of the rules, to each part of the game. There were a lot at hand to recall, with lots to understand as well. While it may be fun, and sometimes hard as well, it was a throwback to a classic TV/film title of the same name, that stayed true to what it was based off of in the first place. "Legends of the Hidden Temple", is just like the TV show and accompanying film, it is so much fun and so entertaining, that all the teens and adults playing it, to bring back that old school feeling, will feel right at home, with ease and enlightenment. You can buy this game at online retailers and local retailers like Target, Amazon, etc.